In 1974, Kubota Tractor Corp. launched the first 12-hp, four-wheel-drive compact tractor in the United States. 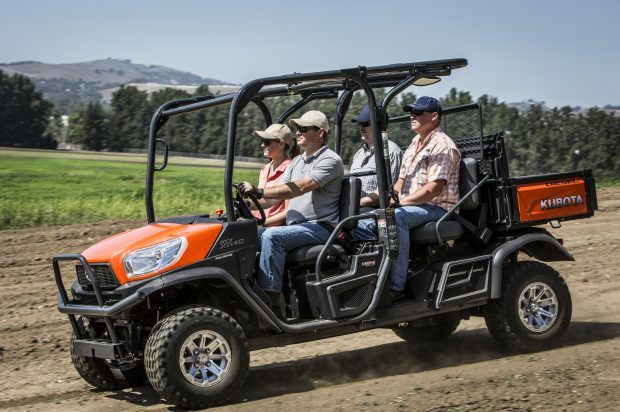 Since 2004, Kubota RTVs have been the best-selling diesel utility vehicle in North America, according to Power Products Marketing’s North American Utility Vehicle Report. The new RTV-X1140, Kubota’s latest addition to the line, features an innovative Kubota K-Vertible cargo conversion system, which transforms the vehicle with minimal effort and time from two passengers and a large cargo bed to four passengers and a cargo bed. The RTV-X1140 delivers a 24.8-hp Kubota liquid-cooled diesel engine, work-proven for dependable performance even in the harshest terrains. With convenient tilt steering and simple inline shifting, the RTV-X1140 has a variable hydraulic transmission that offers wide torque band and large oil cooler that boost performance and durability. Front and rear independent suspension on all four wheels ensures a good ride, enhancing drivability and handling in most off-road conditions. Kubota’s RTV-X1140 offers a full 11.3 in. of ground clearance and 8 in. of suspension travel, providing the ability to glide over bumps and rugged terrain, says the company. The RTV-X1140 offers a variety of standard and optional features to enhance productivity and operator comfort. Options include alloy wheels and a factory-installed, spray-on bed liner to protect the cargo bed from dirt and damage. Driving comfort comes standard with an ergonomically-designed, split-bench-style seat designed to provide hours of smooth riding. With sophisticated technology and easy-to-operate features, the RTV-X1140 offers a digital meter cluster with bright, easy-to-read indicators to keep the operator informed of critical driving conditions, including speed, hours and miles traveled. A large glove box on the passenger side provides secure, lockable storage and under-seat compartments beneath the split-bench seats provide convenient storage space for tools, tie-downs and personal items. Also new to 2016 is a front four-point PTO K-Connect for the RTV-X1100C, giving this model the ability to transform into the ultimate snow removal machine, with four new attachments: 66-in. snow blower, 78-in. straight blade, 78-in. V-plow and 66-in. rotary broom. With K-Connect, these new implements connect in seconds without tools and can be easily removed for seasonal storage. The PTO is gear-box driven for durability, less maintenance and quieter operation. The control handle offers simple control for all implements, and the PTO switch is ergonomically-located and easily reachable for double action intuitive control, similar to tractor functionality. For more information, visit kubota.com.